Hi Everyone, I'm very new to this so I hope my description is easy to understand. My granddaughter was presented with an Outstanding Girl Award at her college and as we don't live near each other I wanted to show her how proud we are of her, so I made this card for her. I took a cream pearl A4 card and folded it in half, I then put a sheet I measured some more cream pearl card to just a bit smaller than the peach so that when it is applied to the front it leaves a small matt. I embossed the bottom half of it with the 'Tied Together' embossing folder. I added a strip of cream ribbon to the middle and then stuck it to the front of the card. I cut out a large Chantilly Bow from Tattered Lace in cream pearl and placed that over the ribbon. For the top of the card I stamped a Justrite stamp compatible with Labels 20 from Spellbinders and stamped a sentiment in the middle of this. I embossed with gold embossing glitter which makes it very sparkly. I then finished it all off with pearls. I don't know what she thinks of it yet as I only posted it today, but I hope she will like it. This is a beautiful card and your Grand-daughter is going to love it. It is made with love and dedication so how could she resist. The explanation of how you made it is fine and it serves to help other people who may want to copy your idea. The flowers look gorgeous and for me they finish off a card to perfection. This card was made for a good friend. I started with white pearl card and the largest die from Spellbinders Grand Squares, I cut another three squares out from the next three sizes and matted two of them onto silver miriboard. 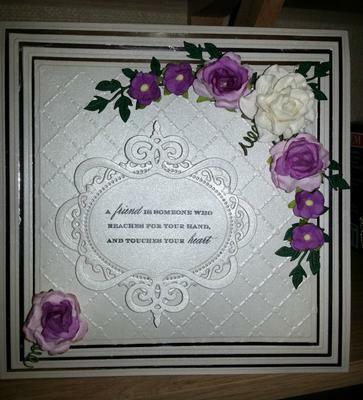 The smallest square was embossed with the Sue Wilson heart lattice embossing folder and then matted onto the miriboard. I used the second largest die from Spellbinders Floral Oval and enhanced it with the large die from Spellbinders Metal Tags and Accents. The flowers are from my stash and Wild Orchid. I cut out a card stand from Marianne and glued it to the back of the card to support it. My friend was chuffed to receive it and that made me feel good, to be able to do something for her. This is such a beautiful card and I am not surprised that your fired loved it. This is definitely a "Keepsake" to be treasured. The size, the color and the card you have used is perfect and those flowers are simply gorgeous. I made this card with Marianne Designables Embossing Folder, Spellbinders Scalloped Borders One, Spellbinders Bitty Blossoms, Spellbinders Spiral Blossom One and Dees Distictively Leaf and Fern Dies. I started with an A4 white card folded to A5. 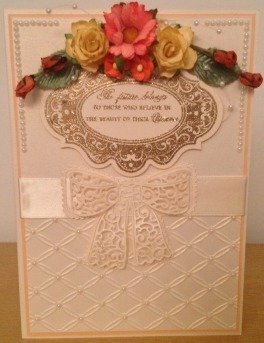 I embossed another piece of white card with the Marianne folder and cut down each side with the pattered scalloped border. I then cut a piece of pink card down each side with a plainer die from the scalloped borders and matter the white card on top of it. I then cut our the flowers in white, coloured the bottom with pink as I only wanted the colour there and the tops white, cut out the leaves in green and applied them to the middle of the embossing. A few gems down the side of the pink card finishes it off beautifully. This is not made for any specific occasion, I will just add it to my stash to use at a later date or to sell if someone asks me for a card. 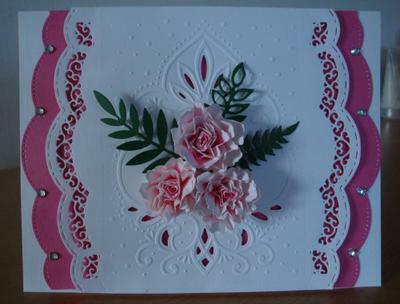 A beautiful card that would be suitable for any occasion ans one I am sure would be well received when you send it. It is always a good idea to have some cards kept in reserve for that unexpected occasion when you either need a card for your self or some one asks you for one.